From its widescreen vistas, which are shot on 35mm film stock, to its ultra-slick action sequences, Westworld walks with the big-budget swagger of a summer blockbuster. Nothing it does could be described as small. So it was unsurprising that last night's 90-minute series finale, "The Passenger," swiped a page from the Marvel Cinematic Universe playbook again by adding a post-credits tag scene, one that contained a major revelation about Ed Harris's Man in Black and teased yet another time-jump for Season 3. If you flipped off the TV or closed the tab too early, you missed an important clue. What exactly happened in the scene? We saw a battered, one-handed William emerge from the elevator into the Forge and come face-to-face with the face of his daughter Emily (Katja Herbers), whom he killed in the previous episode. This version of her, which could be a robot, greets him with a wry sense of inevitability. He looks confused. "This isn't a simulation William," she tells him. "This is your world -- or what's left of it." Emily then leads William into a room that resembles the facility where James Delos was tested for "fidelity" by William back in Episode 4, "The Riddle of the Sphinx." (Important to note: It's not the same place, which we saw get burned up -- for one thing, it's way dustier!) When they're seated, Emily and William engage in a tense conversation that's clearly meant to mirror the conversations between Delos and William (and the Bernard-Dolores conversations, for that matter) from earlier in the season. "I have a few questions for you. The last step is a baseline interview that allows us to verify," says Emily. William asks for what, as the camera settles in on Harris' eyes. "Fidelity," she replies. As with many of the potentially mind-blowing moments in "The Passenger," this revelation is both a compelling twist and a narrative hedge. 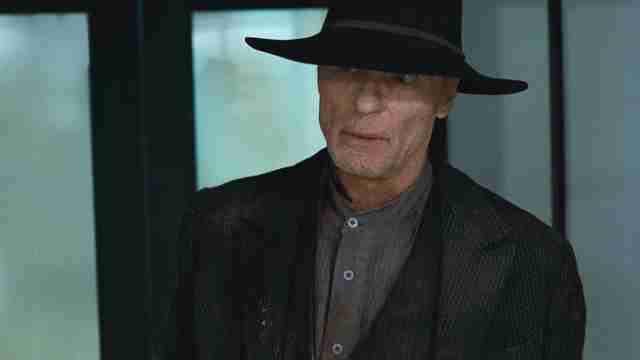 Since the beginning of the second season, the Man in Black has been pointed in the direction of "the Door" and his quest has fed speculation online that this post-credits William could in fact be a human-host who's been stuck in the loop we saw play out in Season 2 for decades, if not longer. (As far as theories go, it's not that wild -- nearly any human character could be a host.) Back in the Season 2 premiere, the young-robot Ford told the Man in Black "everything is code here" and that feels like a smart rule to keep in mind. But even in the post-credits scene, it didn't feel like the Man in Black was any closer to cracking the code than he has been all season. He still looks lost, which only supports the finale's thesis that humans can't change. The scene appears to confirm that the version of William we're seeing in that scene is indeed a host, but upon further examination, the brief exchange between the two characters has less bearing on what we've seen before than it might appear. We still don't know "when" in the timeline this scene occurs, though it's likely sometime in the distant future. It doesn't really clarify anything. It only complicates. That lack of certainty is reflected in the multiple interviews that Lisa Joy has given in the wake of the finale. "Just to clarify, we don't necessarily say he's a host," Joy told The Hollywood Reporter. "A host refers to a creature like Dolores, someone who is pure cognition, someone who is made up of nothing and has a fabricated body as well. It's definitely a sequence that's indicative of a direction we're going to." While she's unwilling to call the version of William we see a host, Joy has confirmed that Emily is a host in that moment. "Katja Herbers in the future talking to the Man in Black is now a Host version of Katja Herbers," she told The Wrap. Over the course of two seasons, Westworld has shown that it values misdirection above everything. It's easy to imagine that Season 3 will find Nolan and Joy using further scenes between this new robot Emily and the possibly-a-host Man in Black in the same way it used the multiple conversations between Bernard and Dolores in Season 2. These are essentially thematic palette-cleansers that can tease out vague clues and toss out hints before finally snapping into focus chronologically around the time of the finale. There's a benefit to having a thread that appears disconnected from the primary story. It creates a feeling of intricacy and mystery. If you're inclined to give Westworld a generous reading, the introduction of new time periods and new possible-hosts is all part of the show's rich web of intellectual ambiguity. In one interview, Joy said that series is about "reinvention" and "scope," implying that future seasons will also continue this pattern of ambitious expansion. If you've grown frustrated with the show's love of elaborate guessing games and puzzling reversals, the post-credits scene was yet another reminder that Westworld will continue to test your patience in future seasons. Its fidelity is only to its own convoluted mythology.